THE SAGA OF GEORGE WASHINGTON AND MARTHA ANN MORGAN HAUSER IS TOLD THROUGH DIARIES, SCRAPBOOKS, PHOTOGRAPHS, POETRY, LETTERS AND FAMILY RECORDS. THE SAGA OF GEORGE WASHINGTON AND MARTHA ANN MORGAN HAUSER IS TOLD THROUGH DIARIES, SCRAPBOOKS, PHOTOGRAPHS, POETRY, LETTERS AND FAMILY RECORDS. MARTHA’S FATHER, STEADFASTLY ANTI-SLAVERY, IS DRAGGED AWAY BY THE HOME GUARD IN NORTH CAROLINA DURING THE CIVIL WAR. HE DEFIES ORDERS AND IS TO BE SHOT, BUT IS SAVED AT THE LAST MOMENT. MANY IN GEORGE’S INDIANA FARM FAMILY CONTRACT AND DIE OF DYSENTERY. 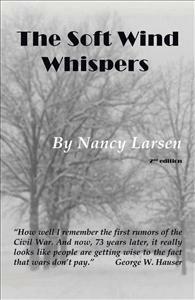 BOTH FAMILIES ARE MOTIVATED TO MOVE WEST TO THE UNSETTLED IOWA PRAIRIE IN THE 1860’S, WHERE GEORGE AND MARTHA WILL MEET AND MARRY. WE JOURNEY WITH THESE ECCENTRIC PEOPLE THROUGH WW I, THE FLU EPIDEMIC, PROHIBITION AND THE ESTABLISHMENT AND LOSS OF THEIR BELOVED FARM, ‘THE MAPLES’. INTERSPERSED ARE STORIES OF LOCAL OUTLAWS, A BROTHEL AND ADVENTURESOME COUSINS. GEORGE’S EARLIEST AMERICAN ANCESTOR, MARTIN HAUSER SR., CAME TO PENNSYLVANIA IN 1727. FROM THIS ERA ARE STORIES OF THE REVOLUTIONARY AND CIVIL WARS AND OF THEOPHILUS HAUSER AND HIS SLAVE, BETHANIA AND THEIR DESCENDANTS.